I was impressed with the packaging! Beautiful frames. Love this frame! We have selected this frame many times, as it looks beautiful! 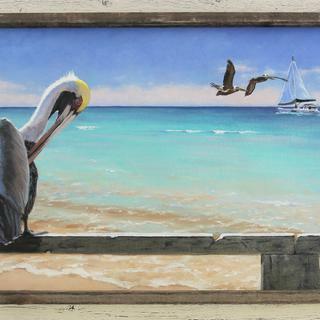 I knew immediately that I had found the perfect frame for "South Carolina Mozie " because it was the ideal combination of beach and rustic feel. The sizing fit as always. Just one thing to realize is that the elevated inner border can throw a shadow depending on the direction of light. 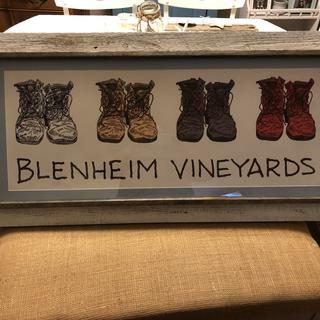 It's a bit pricy but we love the frame. It looks really nice - and just as pictured. I feel like prices have increased on this site over the years, but I still find myself going back to this site rather than using the local stores. About the same price when you add on shipping. Hello David. Your feedback if very valuable to us! We are pleased to know that you love the frame. We make it a priority to offer our Prints, Frames and all other framing materials at wholesale prices. Over the years we have kept our merchandise set at the most economical prices we can offer. We extend sales promotions to our customers via our website, and we also have a emailing list that will allow you to have special offers extended to you. Please take advantage of being the first to know about our promotional offers via email by signing up today! We understand that you have other framing companies to choose from, and we are grateful that you considered us. Happy Framing! Love this! Perfect for my picture and we'll made. The hanging hardware that came with it was great and east to use. I love it! It was the perfect compliment for a very old photo of my grandfather as a child in the 1890's. It is a wonderful, fun photo and had a dark brown mat edge. I was concerned that it would look strange with the photo, then dark mat, then light, then dark. But this frame that has the dark border to the inside was the perfect solution! Service is awesome. Hard to to get used to seeing nailholes in the frame but they do beautiful work! Exactly what I wanted, high quality, packed very safely...arrived promptly .. will use this company for all my future framing needs! My oil painting looks rustic and just stunning with this frame. The price is little higher than my other frames but it is worth it. The frame is even better in person than on the website. Love it! Loved it all. My canvas was a little short we we added a small beading inside to hide out edge. Got these as a gift to my daughter to match the ones I bought last year. She absolutely loves them! I really like the rustic quality of this frame. It definitely complimented the composition of my painting, "Preflight Inspection". As described, but a bit rough. Definitely a rustic frame, but too many splinters though; it required some repair to make it presentable. Love the choice and service from this company; I just made the wrong selection this time. 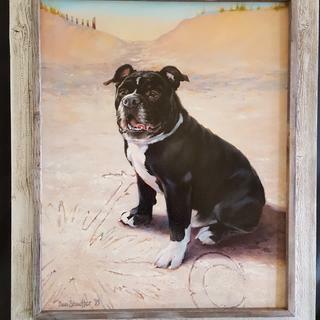 I appreciate that this product is made from recycled wood and therefore comes with imperfections, but the obligation should still be upon pictureframes.com to use recycled materials that are appropriate for framing. The 20x24 frame I received was splintering and lifting on several edges, in lengths as long as 5 inches. It was a custom frame...someone at pictureframes.com had to spend a good amount of time handling the product...so either they were so rushed they did not notice (impossible to believe), or pictureframes.com is willing to manufacture and ship sub-standard product. In addition, the interior dimensions of the frame did not match my order (about 1/4" too narrow), requiring me to trim the art piece to fit the frame. I have order 11 frames from picstureframes.com this year, and three of them (that's more than 25 percent!!!) have failed to meet my expectations for quality, workmanship and value. Hello Damien! Thank you for your review. We are more than happy to offer you a full refund for the frames you are not satisfied with. Our goal is to provide you with frames that exceed your expectations. If you are hoping to return the frame we are glad to email you a return label and give you a full refund. If you would please give us a call, we will be glad to set up the return process. We can be reached at 1-800-332-8884. Happy Framing! I love the look of the driftwood with my sea image. The depth of the two different colors helped to bring out the colors of the Sea Otter and the ocean surrounding him. Perfect complimentary colors. Together the piece is just beautiful. I couldn't ask for a better pairing. I have been extremely happy with every frame I have purchased, and I look forward to purchasing many more. This is also the first time I have ordered matting and glazing so I am ecstatic with my purchase. I am ecstatic!! 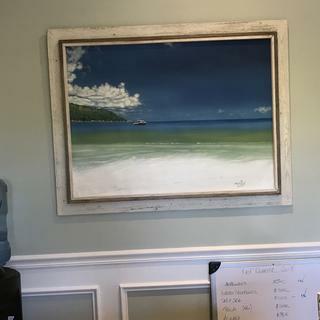 Goes well with a painting of the beach and also the customer chose it. I love the last frame I purchased from here. The last one was gray on the outside and white on the inside. It will be perfect in a western, rustic bedroom. I chose this frame because of the desired style and size. I chose this frame because the white washed component matches our bed and the raw wood goes with the bedspread. I will be putting in a painting I did of Yosemite Falls! Excited to see it on my wall! I have gotten this frame before on a print that I had made by picture frames. It looked fantastic. so I tried my image of a new painting in this and had to have it. Works well with a beach themed sunroom. My painting is a winter scene and I wanted a rustic looking frame for it. Framing an original Eskimo print from an Alaskan artist circa 1965 and the natural, reclaimed wood seemed to befitting of the subject matter and complimented the ink in the print. It complemented the subject of the artwook. I am always happy with frames I have purchased from pictureframes, always fit perfectly and are extremely high quality. Can this frame be used as a floating frame for stretched canvas art? BEST ANSWER: Hello! 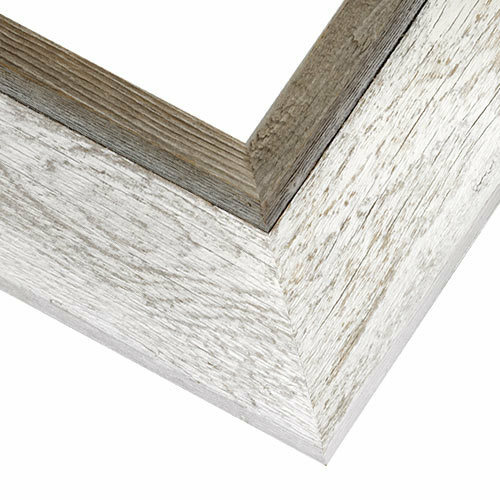 This beautiful Rustic Frame is not designed to be a Floater Frame but we have another collection of frames that are made of Barnwood. Please see the frame below and let us know if you have any questions. Have a great day! I want to frame an oil painting on stretched canvas that is 24”x18”. Can canvas clips be added to any of your frames, or do I need specific frames for stretched canvas? How do I specify for the clips? BEST ANSWER: Hi Laura. Canvas clips can be order by phone at 1-800-332-8884. When framing canvas, be sure to check the rabbet depth of the frame matches the depth of the canvas. Each frame ordered does come with hardware clips already for you. Thank you! My canvas is 48"x36". Would it be possible to make one in that size and what would the price be? Just to confirm, this is for canvas prints correct. BEST ANSWER: This frame does max out at 42" due to the material it is salvaged from. I am attempting to frame a watercolor picture that has a 1/8" or 3mil thickness. What kind of mat or liner should I purchase? Also what is recommended for the glass? BEST ANSWER: Hello Charles. Choosing between a Mat or Linen Liner is a personal preference. We suggest using the Acid Free Mat if you are hoping to preserve the watercolor for years to come. The linen liners are built inside the frame and are actual pieces of wood wrapped in linen. We recommend using our Acrylic instead of using glass with the Frames. If you need further assistance, please let us know. How do I view my painting in this frame? I don’t see any way to down load a picture. BEST ANSWER: Hello! Please click on the link below to view your painting inside our Custom Frames. Have a great day!